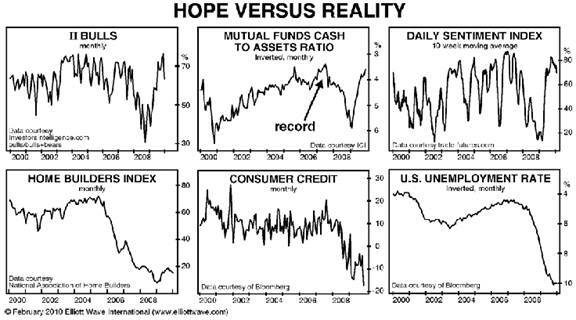 Bullish expectations (shown by the top three panels) may not be quite as extreme as they were in 2007, but adjusted for underlying economic conditions (bottom panels), the current psychology probably ranks right up there with the most complacent outlook in history. The charts of housing, consumer credit and unemployment show the systemically sluggish state of the economy. We know that fundamentals always lag psychological trends, but the lag is generally only a matter of months. It’s been nearly 11 months since the outset of the Primary wave 2 rally; by these critical economic measures the rebound is barely registering.The wide disparity between the hope of investor expectations and the reality of economic strength shows that the great bear market — already ten years old — remains in its early stages. As the next legdown matures, hope will turn to despair, and it will become impossible to ignore the persistence of the economic contraction. expectations are with street-level demand. A blog called The Peking Duck described Beijing’s “stunningly dysfunctional, catastrophic mall, The Place. Fifty percent of the eateries in the basement were boarded up. The cheap food court, too, was gone, covered up with ugly blue boarding, making the basement especially grim and dreary. There is simply too much stuff, too many stores and no buyers.” The world’s largest mall in southern China is completely empty. Most investors do not see past the performance of the Shenzhen or Shanghai stock indexes, just as most of the buying and selling of U.S. stock indexes remains detached from the real economy. We see lots of hope but no change in the reality.